Cleaning our environment should be something we do all through the seasons. We cannot put a price on our health and the only way to stay healthy is by staying clean at all times. Gutter cleaning should be an important part of your day to day routine cleaning of the exterior of your home. Generally, the late October and most of November is a great time to have your gutter cleaning done. The spring season usually ushers in tremendous house opening which is a good thing for the family and house occupants in general. Pine needles, leaves, and shingle decay all add up to a roof drainage system full of debris. These debris are viable of causing significant damage to your roof if your gutter cleaning scheduling is not properly set up. Another important thing to remember is that your gutter area is hidden from view and could be a potential hidden den for all sorts of unwanted guests. Also, during summer, your gutter get very warm making it suitable for warm blooded organism to breed successfully. This area is the perfect place to find all sorts of hornet nests and we can tell you from experience that we have seen as many as seven different species. Houses with trees around them can breed tree frogs in their gutters, scheduling your gutter cleaning is the only way to get rid of those unwanted guests. Times without number, we have been shocked by hopping frogs living comfortably in gutters. This can be a great concern when you’re up on a ladder and you become startled at the sight of this creatures. Gutter cleaning is so important because gutters are an extension of the roof that sit right on top of our heads. Gutters are the reason your house don’t get flooded during those heavy down pours rainfall. When it comes to water migration from your roof to the designated destinations, your gutter collects the bulk of water that flows down from your shingles and transfer them safely to where they are meant to go without leaving any mess around your home. When you allow your gutters to be filled with clogged or debris, your roof system become ineffective. As clogged filled gutters will not allow water to be directed to the down spout. If the debris is heavy enough during the down pour of rain, your roof may collapse in some rare cases. Most homeowners believe it’s something they can do themselves, hence, they engage in DIY approach. The catch is, blockage can be in the middle of the down spout or at the angled areas, therefore some special equipment and experience is needed to do a fine job. Water collecting in a dirty gutter system, has the potential to harbor hidden fungi and bacteria. Gutter channels that have large amounts of debris can allow water to lap over the sides of the channels. Some of these fungi can be deadly when they come in contact with human body. Most especially in cases where the occupants of the house are young family. Water over lapping on your exterior fascia boards can cost you more money than scheduling a regular gutter cleaning. If the exterior of fascia boards behind your gutter are saturated by water lapping over the gutters, extensive rotting may occur. Extensive rotting of your exterior fascia boards may cost you a full replacement. Also, water may migrate to the underside of your exterior siding or soffits which may then create potential mold growth, hidden rot and water damage. Gutter cleaning is far more crucial than how some homeowner takes it. Most homeowners do not understand that carpenter ants love to tunnel through wet woods and colonise. When you allow water over lapping into the exterior fascia of your board, water may be deposited against your home foundation wall through those over lapping. The likelihood of this occurrence is very high during those heavy down pour of rainfall. Regular gutter cleaning and down spouts will allow water to be easily directed away from your house foundation, soffit areas and siding. Gutter cleaning work is not advisable to be carried out by inexperience person. It involves working on an extension ladder with good support and balancing for safety reasons. Sometimes, it involves working at inconvenient heights. Without proper training to stay focus on job at hand while standing on such height may lead to injuries when homeowners try the DIY approach. Rite Price Roofing has been in the business of all things roofing, roof restoration, gutter cleaning, and anything roof for decades. We have been helping Adelaide and South Australian families look after their home for a very long time and we have highly experienced gutter cleaning experts that have been bringing nothing but smile to Adelaide family face for decades. Give us a call today and we will be more than happy to clean your gutter effectively. Gutter cleaning is one of those laborious tasks that is simply never easy to complete, let alone begin in the first place. Anyone that has cleaned their gutters will tell you that it’s unimaginable how dirty those things can become. Thankfully, there are a wide range of steps that you can take to prepare your gutters for the rainy season, as well as tips on proper gutter cleaning. 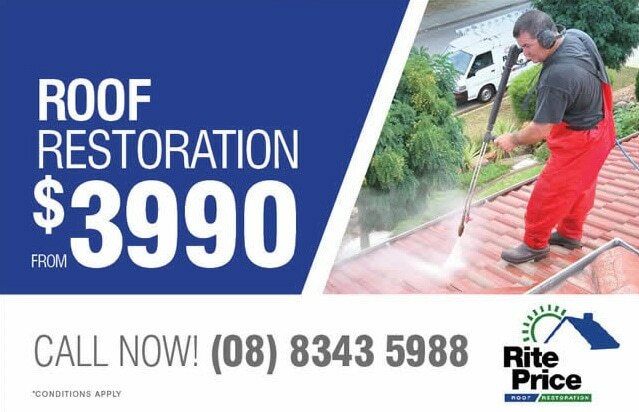 If you have further questions, don’t hesitate to give the Rite Price Roofing team a call at (08) 8348 5988 and we’ll be happy to help. When cleaning out the leaves and debris within your gutters, you’re going to need some heavy duty tools. Since gutters at most homes have a tendency of being at least ten feet from the ground, you will need a sturdy ladder to hoist yourself high enough to comfortably clean the area. This ladder can be metal or wood, simply make sure that it is tall enough and is of a high build quality. It’s important to place the ladder on firm ground, preferably concrete. You may also want to have someone there with you to hold the ladder steady as you climb. Once you’re up there, you’re going to want to have either a brush to sweep some of the leaves and debris away or garden gloves that will allow you to remove the debris manually. Both options work well, though the gloves option does tend to be a bit more time-consuming. One of the most important aspects of cleaning your gutters is that you should never lean too far over to reach the dirt and debris within your gutters. This can make for a nasty situation wherein the ladder becomes too wobbly and unbalanced, which is altogether unsafe for anyone. Although it’s a pain, you need to climb down and move the ladder sideways to reach other areas of the gutter once you’ve covered the general spot you started with. Once you’ve removed all of the loose leaves and debris, then comes the tricky part. 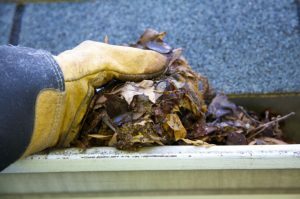 The bottom layer, the one below all of the leaves and sticks, is made up of the rest of the dirt and general muck that has accumulated within your gutters. At times, it is packed solidly and is difficult to remove. A garden trowel can be very useful in extricating the dirt from the gutter. If you have a yard or garden area with lots of mulch just below the gutters that you’re cleaning, you could simply drop the dirt in those areas taking it from the gutter. A bucket can also be a useful accessory that could come in handy for just such an occasion. Now, if you find that the downspouts, which are located at the corners of your gutters, are clogged or simply have a bit of dirt and leaves in them, then you can use a basic water hose to spray jets of water through them. This works well to remove any dirt or clogged up areas that have festered within the downspout and haven’t let water out properly. It’s best to clean your gutters when the contents are dry, as it helps to remove them much quicker. Damp conditions tend to make the process a bit lengthier and more difficult. Lastly, if any problems persist and you find that you can’t unclog something in the downspout or the dirt and grime is layered on too thick in the gutters, then you may want to think about using a pressure washer on them. However, this can be difficult and should only be considered as a last resort. Cleaning the Gutters: When and How Often? As a general rule, it’s important that everyone attempts to clean their gutters at least once every year, which should be upped to 2 or 3 times if there are a large number of trees on your property. 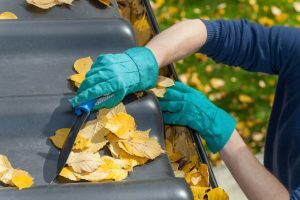 While cleaning gutters can generally be done at any point within the year, the absolute best time to do so is at or around the autumn, once any leaves have fallen off the trees. Doing so at any other time during the year could mean that you would have to clean your gutters multiple times per year. It’s also essential that you clean your gutters if you find that there is a clog in them that doesn’t allow the water to flow freely from the roof to the ground, as water build-up could damage your roof. As those in Adelaide know, the wet season months of May through August are particularly frustrating. One of the most important tasks associated with owning a home is making sure that your gutters are able to withstand the coming of the rainy season each year. As such, you will need to prepare your gutters for this eventuality. If your gutters aren’t in peak condition, then the water build-up could cause untold amounts of water damage to your house and even flooding. This is a problem that can be avoided with a quick call to the professionals at Rite Price Roofing; you can reach us at your convenience at (08) 8348 5988. In conclusion, you’ll want to remember to look over your gutters on a regular basis and make sure that there aren’t any clogs. You will need to clean your gutters by September at the latest each year. Lastly, if you notice any signs of damage or cracks within the gutter frame, it’s important to call us at Rite Price Roofing to sort it out immediately.